Summer is in full swing, and will be gone in the blink of an eye, so don't forget to carve out some time each day to play with your child(ren)! Make it a priority to make a vacation memory every day! As the long summer days wear on, it can be taxing to run from activity to activity, packing and unpacking, entertaining little minds and hands for hours on end; but this precious time together is what your child(ren) will remember best, so be sure to enjoy it with them! Great Travel Games for Kids! 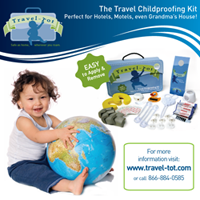 Tips to Help Your Baby to Sleep Well on Vacation!